A few years back I went on my very first guided float trip with my old man. My pops and I were sweating our n**ts off in our waders floating down the river on a 90 degree September day in Wyoming. Meanwhile, our guide was wearing sandals and shorts and seemed to really be enjoying the weather that day. 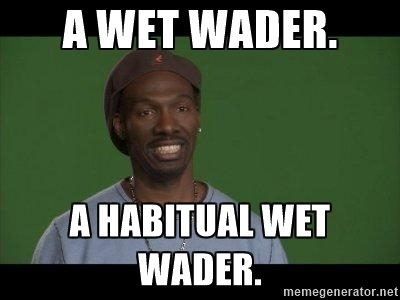 And that’s because he’s a wet wader. Wet wading isn’t for everyone, that’s for sure. Some people are afraid to get their footsies wet, or get gravel in their shoe, or even worse, submerge their jiblets in cold mountain water. And you need to know when it’s appropriate to consider wet wading, and understand the risks associated with enjoying an even greater connection with nature. On hot days, the cold water feels awesome and really balances out your body temperature with the hot sun beating down. You’ll feel closer to nature. You’ll probably be catching fish before everyone else in your party puts their waders on. You won’t sweat all day wearing a 3/4 body condom. You don’t have to worry about puncturing your waders with a hook if you’re not wearing them. You can actually reach your camera or cell phone for a fish pic because you can reach your pockets. You can hike to your destination without being soaked with sweat from the waist down when you arrive. If your hike in to the river is an unknown, or you’re going to be bushwhacking, you could scratch the hell out of yourself walking through thorny bushes. Not fun. If the water is really, really cold, or if it’s winter or spring, you’re going to need waders to stay warm. In the event that you go for a swim, you WILL be soaked from head to toe and need to strip down to your undies and find a sunny spot to warm up in and dry your clothes out (ask me how I know). If you aren’t careful, you might hook one of your legs. You will have more sun exposure to your legs and will need to liberally apply sunscreen to them. At this point, you’re probably wondering what kind of wading sandal, shoe, or boot you might try. I’m sure there are other companies making wet wading sandals, however I recommend the ones that Simms makes. 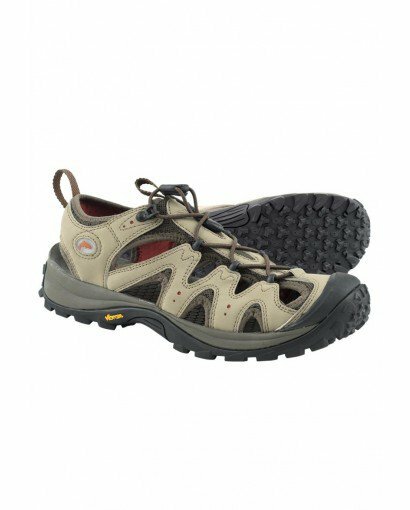 Not only are they comfortable and rugged, the rubber soles on these are next level and work great in just about any wading or hiking situation. And Simms products are simply flat out awesome. Depending on the situation, and how much ankle support you need to wade safely and comfortably, you’ll want to consider your options. I prefer the sandal option overall, simply because I will fish for a couple hours at a time, then jump in the truck and go hit another river pretty frequently, and I don’t like to drive with my wading boots on. I also usually prefer to wear the sandals as hiking out of a river with soaking wet and heavy boots is not overly appealing. One final note… I’m confident I can run away from a grizzly bear faster while wearing wet wading sandals than I can with boots on! Check out Simms products HERE. Regardless of your choice, get out there and try wet wading this summer. It’s a great way to cool off on a hot summer day, and feel more connected with nature. Your best bet is throw all your gear in the truck, and make your decision when you get to your destination and evaluate the situation.